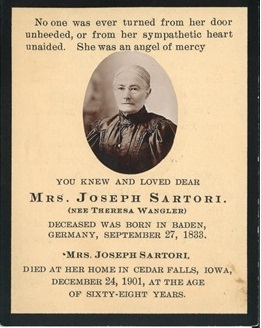 Theresa (Wangler) Sartori was an exemplary wife and mother. This was expected of every woman born in 1833. Her youth in Germany is largely undocumented except for the plain fact of her birth, as a daughter of Konrad Wangler, burgomeister, of Baden. At age 19, she attracted the admiration of Joseph Sartori, a young man learning the stonemason’s trade. However, her father refused to allow their marriage. Joseph immigrated to the United States, found work, and prepared a place for his sweetheart. When he wrote to her, asking her to come to the United States, she came and they were married in 1857. This legacy of care giving was so much a part of who she was and how the community remembered her that the idea of care and succor and the name of Theresa Sartori cannot be separated. When she died at the age of 68, Cedar Falls mourned “the most sincerely Christian, the most unselfish, and the most charitable woman” they had known. Joseph Francis Sartori’s memorial to his mother was fitting. He gave the money for Sartori Hospital to be built. What better monument could have been erected to memorialize a woman who devoted herself to the care of her fellow citizens? At the dedication of the hospital it was remarked that the hospital would “continue the work so near to her heart, and will minister to the poor, the afflicted and the suffering until time shall be no more.” Theresa Sartori gave aid and succor to her fellow citizens to the end of her life, asking nothing and expecting nothing in return. Her service to her community inspired her son to build a community hospital—a hospital that has continued her work for 102 years.